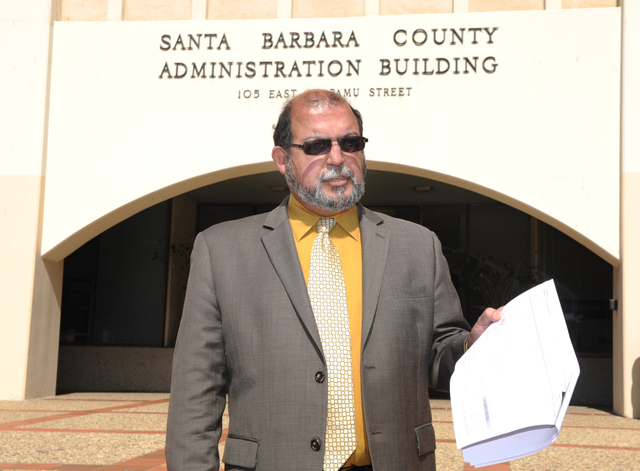 Goleta City Councilmember Roger Aceves — who is challenging Supervisor Janet Wolf for her 2nd District seat on June 3 — alleged on Wednesday that Wolf involved herself in “potential conflicts” by not disclosing the $60,000 she received from the Service Employees International Union (SEIU) prior to addressing SEIU-related matters. But county counsel Mike Ghizzoni pointed to a fact sheet put out by the state Fair Political Practices Commission (FPPC), which Aceves claimed Wolf went against. The FPPC document states that such disclosure rules don’t apply to “local agencies whose members are elected by the voters (e.g., city councils and county boards of supervisors).” The $20,000 and $40,000 donations Wolf has received from SEIU in the last few months were reported as required in campaign financial documents. On February 14, Wolf received $20,000 from SEIU Local 620, which represents 1,850 county employees, including public defenders, custodians, and maintenance workers. On February 18, Wolf — along with all of her fellow supervisors, minus Peter Adam — voted in favor of a new contract for the union, which had been negotiating with the county for months; the new contract stopped freezes on merit step increases and allowed 2 percent wage increases after years of furloughs. Aceves claimed that Wolf again misstepped when, after receiving a $40,000 donation from the statewide arm of SEIU on March 6, she didn’t disclose that when the supervisors discussed outsourcing Public Health lab services — which employs SEIU members — on March 11. Wolf and others had questioned the length of the contract, but ultimately they decided to postpone a decision on the outsourcing until this week’s budget workshops. Public Health announced on Tuesday that it wouldn’t revisit the idea for another year. Aceves called it “egregious” for Wolf not to disclose her donations during those discussions. “She received money prior to a vote,” he said, saying the issue is more about ethics than legality. He said he has recused himself from the Goleta City Council when items regarding Deckers Outdoor Corporation come up, as he owns stock. He added that he will mention the $500 that Venoco gave him last November when the council votes on an agreement with Venoco on Tuesday; should the State Lands Commission approve the project, the city would be finalizing an agreement with the company on how the oil would be processed. Bruce Corsaw, the executive director of Local 620, said he sees the issue differently. “We take objection that we are trying to buy a vote, which is what he’s claiming,” he said. Corsaw said that the union endorsed Wolf in early 2013 — prior to contract negotiations, which began in April 2013 — and has supported her for years even in spite of her votes against oil development, which the union supports and is an industry from which Aceves has received numerous campaign contributions. Wolf and Aceves will participate in two debates prior to the June 3 primary election. The first, hosted by the Goleta Valley Chamber of Commerce, is scheduled for Wednesday, April 16, from 9-10:30 a.m. at the Bacara Resort. They will face off again on Wednesday, April 23, from 6-9 p.m. at the Goleta Valley Community Center in a forum put on by the League of Women Voters.